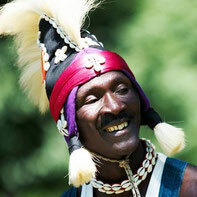 Sayon will energize and uplift you by the music of his people directly from the heart of Guinea, West Africa. A joy to spend time with! Namory is known for his love of his village, his respect for traditional music, and his awesome and infectious joy of life! You are anyone interested in getting better at drumming. From Beginners to Professionals - all will be attending. You will LOVE this. We expect people of many levels of playing, Beginners to Professionals will be attending all of the workshops. As we work our way toward Sunday the challenges increase but you can do it! Traditionally, the most exciting workshop will be Friday night so don't miss that one! If you have played a hand drum before you will fit right in. If you are a professional drummers there is a place for you and you will love the experience. Those familiar with 27 years of DrumConnection offerings will know what we do and how good it gets. It will be that good! I hope you will enjoy the ride with us. You are most welcome. 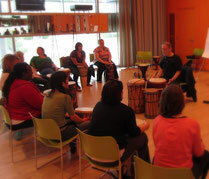 Sayon Camara - Sayon is a rare gem of a drumming instructor! A djembefola as straight and true as the crystal-clear sounds he produces on the djembe drum, his teaching and performances will energize and uplift you by the music of his people directly from the heart of Guinea, West Africa. You will be given a gift of not only the rhythms that will stay with you but with the richness of traditional culture, inner joy and a sense of well being. Sayon also has a number of excellent CDs available. 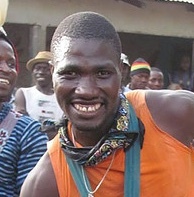 Namory Keita - Born in the village of Sangbarala, Guinea, he began drumming when he was a young boy eventually becoming the lead drummer for his village in 2006. His brothers, Solo Keita, living in Japan, and Nansady Keita, in Guinea, grew up drumming with Namory all under the tutelage of his uncle, Famoudou Konate, one of the most famous West African drummers in the world and the most important with his knowledge. Namory's CD Kolafolo, meaning the ‘Beginning of Everything’, was recorded in 2010. Namory is known for his love of his village, his respect for traditional music, and his awesome and infectious joy of life! 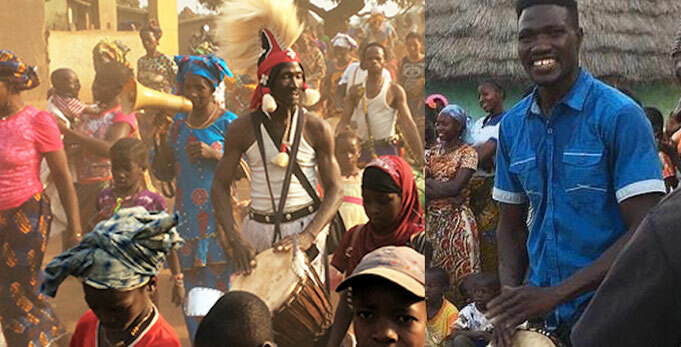 Both Master Drummers sought after as teachers and performers with unique styles and a wealth of traditional knowledge very rare to find outside the villages of Guinea. The accolades are amazing and endless - suffice to say, if you have ever spent time with either or both of them when they have visited DrumConnection with Mamady Keita, Bolokada Conde, Wadaba!, Moussa Traore or yes, even THE Grandmaster himself, Famoudou Konaté, you will certainly want to study with them this Summer! Both artists are known for their love of their home villages, respect for traditional music, and infectious joy of life you will not soon forget. This is the stuff the young kids coming up really need to know. Not everyone can teach this at the level of knowledge and correctness of the ages. These guys can do that! And will! As a personal note, I have known them both for many years. I hired Sayon as Lead Instructor for DrumConnection Trips to Guinea for many, many years and played with them both, here and in Guinea. Namory works for DrumConnection weekly now providing us with culturally based programs and a wealth of knowledge. I am honored to have them together again in these exciting, informative, and soulful drumming workshops. Join us on this incredible journey! Sign up for as many workshops as you can! Take the whole package for a discounted price. And Early Bird Special is also offered through June 20, 2017. Hurry, don't wait! All workshops will be limited enrollment. Our space at DrumConnection and the Event Room are all comfortably Air Conditioned. Parking is especially easy when you follow our lead. After you register, you will receive a personal confirmation and all the necessary info you'll need to make the workshops a success for you! Pro djembe rentals available.